The Cruiser keeps on rockin' with the collector grade version. Sharing the same profile as well as similar design components of the military version, the "uptown" Cruiser CG rockets out of the gate with style. "The Cruiser has the ergonomics that make it fit in the hand beautifully. It's a piece of sculpture. It has all the right things: the construction and mechanics are flawless, it opens and closes smooth as glass, and has gorgeous handle materials. A knife has to look beautiful open and closed and have a different personality in both positions. The Cruiser has that." This Cruiser utilizes a 6AL4V titanium mainframe, .090" thick with radiused edges around its entire perimeter. Inside is an inlaid titanium locking leaf spring, recessed and secured within the frame for slimness. This platform provides lightweight, rock-hard stability to the knife. Several optional custom features are incorporated into the collector grade Cruisers that are shown. "Shadow box" scales, with a stylish profile and a hand-fitting oval shape, are recessed at the inner edge of the radiused frame perimeter and have a scalloped face matching the inset engraved disc. The raised, stainless steel engraved discs (scroll engraving shown is by Michael Collins) serve as an artistic accent. 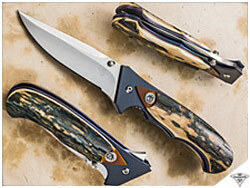 The heat-treated titanium sub-plate provides a decorative handle transition and color accent. The titanium mainframe pieces have been textured and colored to enhance their appearance. 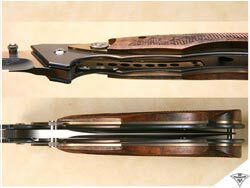 These optional features on the handle create a stepped-down "terrace effect" flow: from scale, to engraved disc insert, to sub-plate, to the titanium mainframe underneath. 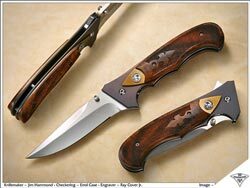 In addition, the blades shown have mirror finished bevels with a satin finished ricasso. 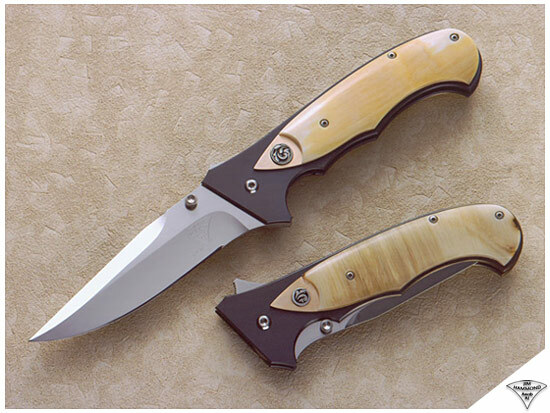 Whereas these features are custom add-on options, the standard (base-price) collector grade Cruiser comes with a satin finished blade, bead-blast finished mainframe, and micarta scales which match the full visible profile of the titanium sub-plate shown on the knives in the photograph. As Blade magazine stated, "Dressed-up tactical folders are hot and appear to be getting hotter, including Jim Hammond's Cruiser." Unmatched elegance in a modern styling-the Cruiser points the way to quality.